Global Packaging Materials Market size was estimated over USD 900 billion in 2016 and will exhibit growth by a CAGR of over 3% up to 2024. High growth in the global food & beverage industry will propel packaging materials demand during the forecast years. These products are extensively used in the packaging of raw & processed food items. They are also increasingly used in packaging bulk food products such as grains, cereals, etc. Rising consumption of frozen meat products, canned sea-foods, and ready-to-eat meals across the globe will augment the packing materials market growth. High consumption of alcoholic and non-alcoholic beverages will also be a major growth enabler for the market. Alcoholic drinks such as beer, whiskey, wine, etc. are packed in glass, metal as well as rigid plastic bottles. Glass and rigid plastic bottles are also widely used in packaging non-alcoholic beverages such as soft drinks, energy drinks, juices, etc. The global food & beverage industry size exceeded USD 4.8 trillion in 2016 and will grow by a CAGR of around 4% in the next five years. This enormous size of the global food & beverage industry coupled with a steady growth rate in the next few years will be the major factor behind the packaging materials market growth during the forecast period. Proliferation of the household products industry will be a major factor behind the packing materials market growth. Household products include detergents, cleaners, disinfectants, etc. and their increasing demand owing to adoption of healthier lifestyle by consumers and awareness about the benefits of cleanliness and sanitation will propel the global packaging industry. The global household cleaners market value was more than USD 25 billion in 2016 and will exceed 35 billion by 2024 gaining by a CAGR close to 4%. Rising demand for personal care products will also have a positive impact on the packing materials market growth. Rising income levels of consumers in emerging economies and willingness to spend on personal grooming will increase beauty and skin care products’ demand in coming years. The global personal care products industry will surpass USD 600 billion by 2024 and will drive demand for packing materials during the forecast period. The global packaging materials market has been segmented according to materials into paper & cardboard, rigid plastics, metal, flexible plastics, glass, wood, textiles, and other niche materials such as foams, leather, etc. Rigid plastics is a major material segment which will gain by a CAGR exceeding 3.5% during the forecast period. This segment’s market will be augmented by the increasing demand for polyethylene terephthalate (PET), high-density polyethylene (HDPE), and polyvinyl chloride (PVC) bottles for packaging drinking water, soft drinks, juices, etc. Rigid plastic materials are also extensively used to pack processed food products, cosmetics, pharmaceuticals, household products, etc. Metal packing materials is also a major segment accounting for close to 20% of the overall market according to value. Metal cans are widely used for packaging beer and other beverage products such as energy drinks, soft drinks, etc. High consumption of beer in Asia Pacific, North America, and Europe will increase demand for metal cans in coming years. Metal containers and bottles are also used in packing food, cosmetic, and pharmaceutical products owing to their resistance towards the effects of external environment, chemicals, and their structural strength. Aluminum, tin, and steel are the most widely used metal packing materials owing to their superior properties and comparatively lower costs. According to product, the global packaging materials market is segmented into bottles & cans, containers & jars, bags, pouches, & wraps, closures & lids, boxes & crates, drums & intermediate bulk containers (IBCs), and other packaging structures such as bins, trays, etc. Bottles & cans are a major product segment accounting for close to 20% of the overall market in 2016. They are employed in packaging a broad range of products including beverages, chemicals, household products, personal care products, pharmaceuticals, etc. Increasing demand for beverages across the globe will drive this segments market during the forecast period. 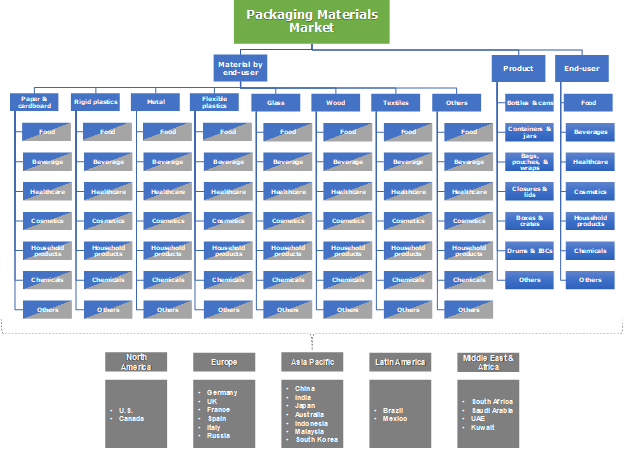 The global packing materials market is segmented according to end-users into food, beverage, healthcare, cosmetics, household products, chemicals, and other industries such as electronics, construction, etc. Household products is a key end-user segment which will gain by more than 4.5% CAGR during the forecast timeframe. Rising demand for household cleaners, detergents, and other sanitary items will augment this segment’s market. Food is the largest end-user segment and was valued at more than USD 300 billion in 2016. Rising packaged food demand across all regions of the world will augment the food end-user industry segment. Rising popularity of frozen and raw meat products, dairy products, and seafood will also contribute towards this segments market growth. The global packaging materials market is characterized by the presence of many small and large manufacturers owing to the wide range of product types and materials that are available. Some of the key players in the market include Amcor, Ball Corporation, Crown Holding, International Paper Company, Mondi, Owens-Illinois, Reynolds Group, Sealed Air, Stora Enso, Berry Plastics, etc. Amcor’s acquisition of Hebei Qite Packing Co. Ltd., a flexible packaging company in Northern China, helped them to expand their business in the Asia Pacific region. Such acquisitions along with mergers and capacity expansions are commonly used strategies by the companies to improve their market positions. Packaging in some form or the other has been in existence since early days to assist humans in storing, transporting, and protecting a wide range of products. This industry witnessed a major shift after the development of plastic products for packaging applications. With new technologies and materials being developed in a continuous basis, the global packaging materials market is dynamic in nature. 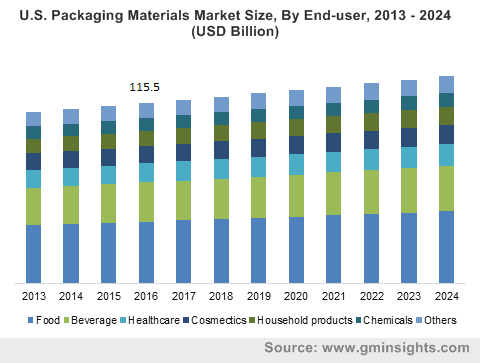 The use of packing materials to preserve a variety of products along with the shift in consumption habits of people across the globe will drive the market in years to come.